Next Saturday, 19 April Rupert invites you to participate in resident’s Maya Mikelsone’s ‘Table Culture Workshop’. After more than twenty years of Soviet Union’s collapse and the introduction of a new political and economical system, many of the traditions cultivated in soviet times are led to be forgotten. Capitalism brought fast food and industrial supermarket products, replacing the time consuming and inventive ceremonials of anticipation, of collecting and exchanging necessary ingredients, gathering and cooking for days in prelude of celebrations in case of meaningful social and private events during Socialism. One of the most important parts of collective celebrations was the table, not only with its contents but also in its forms and aesthetics. It seemed like the imagination of many soviet women manifested itself in the politically neutral and harmless form of food and table decoration, still contrasting the monotony and poverty of everyday life. All this hand made colorful flora and fauna created an extravagant fiction on the table that stays still alive in soviet children memory. 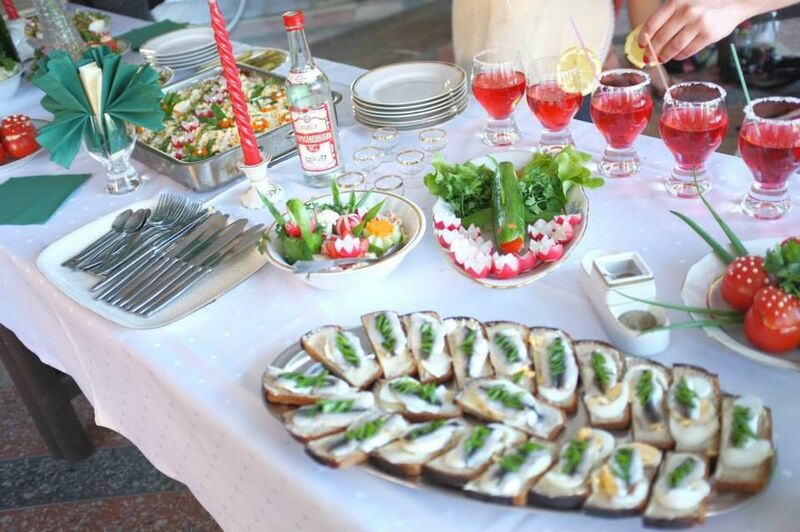 In fact, soviet food and table decoration was an ideological invention of Stalin era in which an important role played Anastas Mikoyan to create a unite idea of fifteen culturally different URSS countries. Re-activating this fading past in the present context might on the one hand offer a strategy to make buried memories and neglected histories re-emerge from a sensual experience and lead on the other to reconsider the skills and inventiveness of creating something from a limited amount of resources. Refering to cooking practice as an interaction, a cultural practice and social function, the Table Culture Workshop aims at the re-evaluation and imagination of new possibilities through such a vital element as food. The workshop will take place at Rupert on 19 April, Saturday, from 3:30 to 6:30 pm. Participation is free and open for all. Please register at monika@rupert.lt. Maya Mikelsone is a Latvian-born curator based in Paris. She has participated in several curatorial and collaborative projects and since 2012 works with Latvian Center for Contemporary Art. During her residency in Vilnius Maya Mikelsone continues exploring the phenomenon of table culture in USSR initiated in collaboration with Latvian Center for Contemporary Art during a seminar “Revisiting Footnotes”.